For chop saws and radial arm saws. 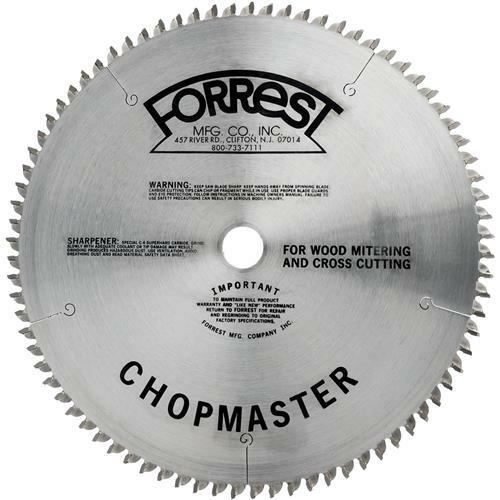 These top-quality miter saw blades produce perfectly cut miter joints. Made with double-hard C-4 submicron carbide for up to 300% longer life. A heavier than normal steel plate and a negative face hook maintain maximum stability for the best cut. Each blade is hand-straightened to a runout of 0.001/0.002 for maximum cut quality. The tooth style (4 points and a flat) maximizes steady, clean cuts with no bottom splintering. You will be amazed by the extra-smooth, tight cuts you will get with this blade. I had been needing to replace and upgrade my miter saw blade. I decided to bite the bullet and man am I happy I did!! The cuts are so much better and super clean, no tear out!! Their might be an equivalent blade out there, but Ill never know.